What is it to become Israeli? If you or someone you know is considering making aliyah, there is a book that offers a glimpse of the experience. Becoming Israeli: The Hysterical, Inspiring and Challenging Sides of Making Aliyah (Rimonim Press) is a compilation of blogs and essays written by 40 olim (immigrants), including the editor, Akiva Gersh. 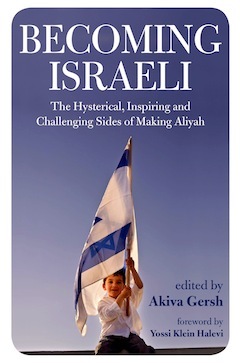 “The book speaks about the various sides of aliyah, from the hysterical, to the challenging, to the frustrating, to the emotional,” Gersh told the Independent. Gersh grew up in the New York area. He and his Philadelphia-born wife, Tamar, made aliyah about 13 years ago. As they were going through the process, Gersh wrote about it in a blog. When he realized others were doing the same thing, he was spurred to collect as much information as he could for publication in book form. The feedback has been good, especially from olim who have read the book and can relate to their fellow travelers. “They went, ‘Wow! Amazing!’” said Gersh. “Every page, they’re like, ‘This is my story!’ They’re laughing, they’re crying. Gersh is a teacher by training and works in a private English-language school in Israel. He also connects with people using music, through a program he started in 2007 called The Holy Land Spirit. Gersh teaches at Alexander Muss High School, a study-abroad institution near Tel Aviv. There, kids from 45 different countries come to learn for a few weeks or up to a few months at a time, about Jewish history and Israel. They spend half their time in the classroom and half their time traveling around the country. “So, it’s academic and hands on,” said Gersh. “It’s awesome. I’ve been there about 10 years now. The language of instruction is English and, for those who want to improve their Hebrew, there are opportunities. “We have young Israelis who are fresh out of the army. And, for those who want the Hebrew experience, they can get it from them and also from being out and about in Israel. According to Gersh, many of the students are experiencing certain aspects of Judaism for the first time. This is something especially meaningful for him, he said, noting, “I had no connection to Israel growing up at all. I never thought about it, nor talked about it. It just wasn’t a thing in my community. I heard about it a couple times in Hebrew school, but it wasn’t on the radar at all. By the time I was done with high school, going into college, I was really done with anything Jewish…. In college, I began searching for something more cultural, meaningful, spiritual in my life. Among the places Gersh traveled after college was West Africa, where he spent two months learning more about the drumming he studied in school. Eventually, Gersh did become religious. He spent some time in a yeshivah, both in Israel and in the United States, before making aliyah with his wife in 2004. The foreword of Becoming Israeli was written by Yossi Klein Halevi, an Israeli author Gersh looks up to as a Jew, as someone who made aliyah and as a writer. Becoming Israeli is available on Amazon, and Gersh also has a website, becomingisraeli.com. Next Next post: Build it and they will come?